This oval pendant watch was designed to be worn around the neck or in a pouch at the waist. The invention in the fifteenth century of the coiled metal spring and the balance-wheel regulator meant that timepieces could be smaller than before and even portable. 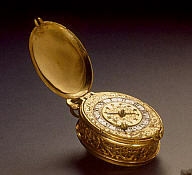 By 1580, clockmakers in most large European towns were capable of creating small oval watches such as the one seen here. Winters, Laurie et al. A Renaissance Treasury: The Flagg Collection of European Decorative Arts and Sculpture. New York: Hudson Hills Press, 1999, p. 35, cat. 6, b/w illus. Bobinger, Maximillian. Kunstuhrmacher in Alt-Augsburg. Augsburg: Rösler, 1969, vol. 2, p. 116. Frauberger, Heinrich. N. R. Fränkel’s Uhrensammlung. Düsseldorf, 1913, vol. 1, p. 19 (as Augsburg, ca. 1560); vol. 2, pl. 2.